I have seen countless posts from style bloggers wearing a cropped top. They all look adorable and I hate them for it. Kidding. Well, kind of kidding. I believe I am not only well past the age of cropped tops, but also far from having a toned, exposed mid-section. I picked up this leopard top at Forever 21 a few months back, also seen here, and thought it was long enough to wear with most bottoms. Come to find out, it really only works with high waist pants or in this case, layered over a dress. I came so close to taking it back because even a showing small peek of my tummy is a personal no-go. After some styling and clothes flinging in the air, I pulled this cropped sweater over my black dress and started to like what I saw. Hey, no skin showing this time. Then came the leather vest and a few layers later this look was created. One of my favorite things about fall and winter is being able to layer my clothes. It's fun to stack pieces on top of one another and come up different style combinations. With my shopping ban still in full effect, remixing a few of my favorite pieces has been key. What's also key is adding a pop of dazzle and sparkle to finish off a look. In this case it was a statement necklace from Lilac Bijoux. The jewel tone colors and design scream fall. It ties the whole look together and took a leopard top and edgy leather vest to a feminine and classy level. Today, my sweet friends over at Lilac Bijoux are giving away the same necklace I am wearing today to one lucky reader. Make sure to hop on over to their website and take a look at all the other pieces they have to offer. A few of my favorites; everything from Loren Hope, a crown ring for all my princess friends and this adorable Mud Pie bow bangle. Use the code shanna20 and receive 20% off your entire order, now through Sunday, November 10th. Happy shopping! You look absolutely STUNNING Shanna!!! I love this outfit, I'm obsessed with burgundy and leopard right now... you've mixed it together to perfectly! You could not even tell this is a crop top - perfect layering option! Like you, crop tops are no go for me. I do not want to show off my muffin top and I always dress on the modest side. A crop top over a dress is such a great idea! I usually just scowl at them since I think they are so cute, but no where near appropriate for me. This is great inspiration, and I just might try this! Really so chic and elegant! I'm so with you on the whole crop top thing! But this look? This is gorgeous, and one of the chicest looks I've seen around lately. Love it! This vest look so good with the leopard top. You look stunning. I cannot do the cropped tops either - but I love this look! So cute. So beautiful! I love the wine color paired with the leopard print! A great fall combo! Forget the crop top! This style is perfect on you. I love the vest I am totally getting the blue color! Oh my goodness, I wish I had half the fashion sense you do! I would never think to pair things like that together. That entire look is fantastic! HAWT. That necklace is gorgeous! Love this look and the layering! I love pairing a shorter top over a dress!! We are similar with the no tummy showing. Great outfit and the color of that vest is great on you! No stomach baring for me! Love that vest, such a gorgeous color. I'm really, really loving burgundy with leopard! That necklace is a true outfit maker. So pretty! Wow if you say this is a crop top then you are lucky because we can't tell the difference which means it's a versatile one & can easily be mixed & matched around! Shanna, you are so gorgeous! Seriously. I LOVE those heels. I just have to know- what lipstick are you wearing?! It's so vampy and perfect for fall. I saw that Revlon just came out with a REALLY pretty deep purple in their Colorstay Lip Suede line. I might have to try that one too. I'm with ya on the crop top thing. Maybe it's because after kids I feel self conscious. I'm just not big on exposing skin anyway. This is a great way to wear it! The burgundy and leopard combo is so perfect. I love this whole look! I am too old for crop tops too...that ship has sailed, haha! 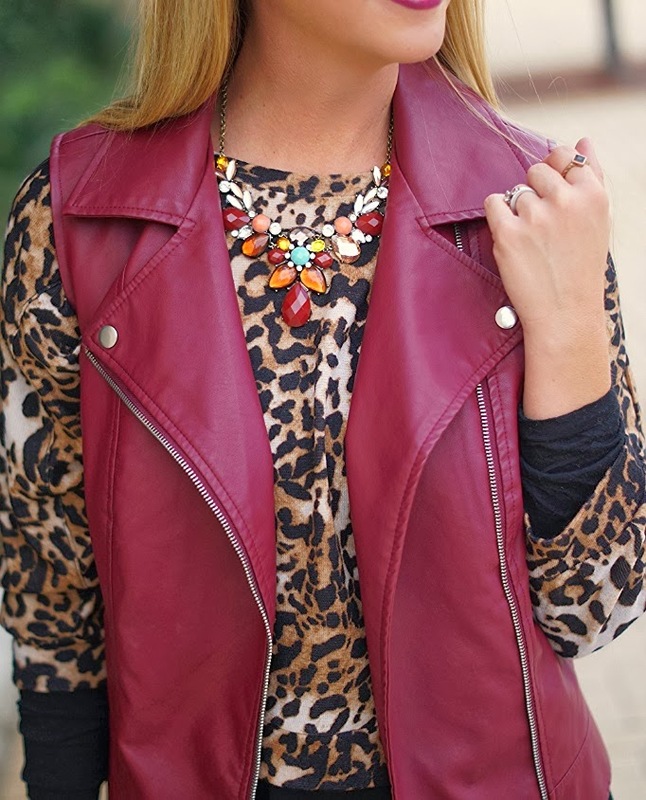 I absolutely love the burgundy and leopard together, such a gorgeous outfit! I'd love to sport the crop top trend, but I'm thinking it's a bit too cold out right now! I love your idea of layering one over a dress! You first three sentences on this post are my sentiments exactly! I will leave the crop tops to my 17 year old daughter, right where they should be! This vest is so cool! I don't even own any vests- I need to get on that! I love the colors and animal print in this look. GREAT shoes too! Love this ENTIRE look!! Such pretty fall color palette! I hope I win - love this boutique! Hope you are having a wonderful day! Haha I am so with you. Even if I wasn't sporting a pregnant belly right now, I would NOT wear a crop top either. It's just not quite age appropriate for me! You look beautiful. I'm in love with that vest. I want to steal it from you! Love the idea of a crop top over a dress! I really love the crop top trend but I just had a baby so it ain't happenin'! But this is super cute. Love this entire look. That vest jacket, and those shoes is just what I need for this season. Love this, and don't worry cropped tops about kill me right now! I mean, baby bump, crop top? Not pretty! Love love! The crop top over the dress is such a great idea! And I love the vest! I love that you thought to layer it over the dress! I feel the same way about crop tops, plus believe me, no one wants to see me in one. You look fab! Your leopard top is super cute! That's how I wear my crop tops! ;) You look awesome! love the color of your vest and that it matches your lips! And those shoes are seriously INCREDIBLE. Oh my goodness, I'm so glad you posted this. I have a crop top that is just too adorable, but like you said, I am a no-go on my tummy showing. Totally throwing it over a black dress :) Thanks girl! You look sooooooo gorgeous!!!! Really love your outfit. Thank you for hosting. A fellow blogger recommended me your blog. 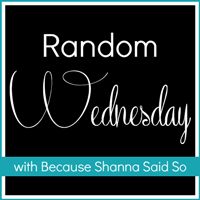 I'm a blogger that stopped blogging for sometime and now came back. I also have a Link Up starting every Sunday. Drop by my blog if you feel like it. love this! you look so gorgeous! I have this same vest in creme and I love how versatile it is! Yes, I've been drawn to some cropped sweaters and tops but will NOT be baring any skin......but now I have a solution!!!!! THANKS! This is such a fun outfit for fall!! 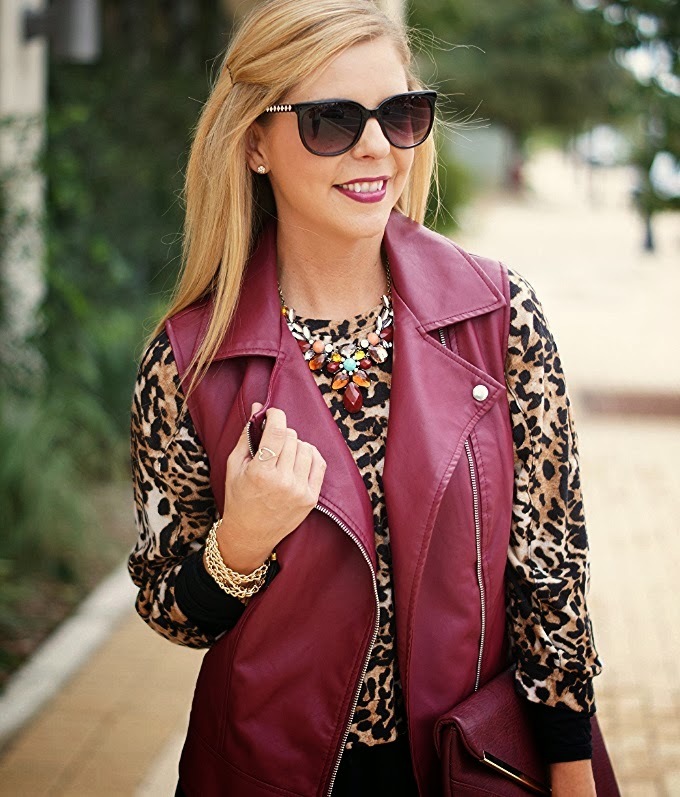 I love this vest with your leopard top! Even if you are not a midriff fan, you have got stunning stems to show off! Thank goodness for layering seasons, so much more interesting outfits are created! Love this whole look pretty lady!